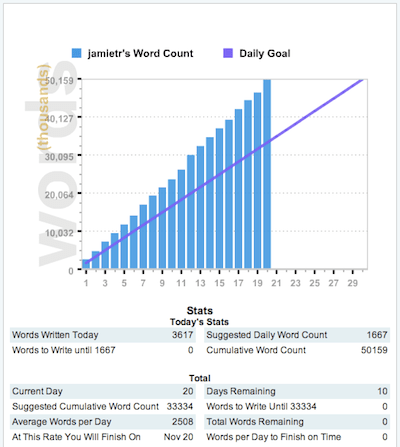 NaNoWriMo Day 20: THE WIN! Posted byJamie Todd Rubin	 November 20, 2010 3 Comments on NaNoWriMo Day 20: THE WIN! It’s pretty exciting to win the challenge in a mere 20 days. But this is only the first step in my larger goal–which is to write a novel that is good enough to SELL. 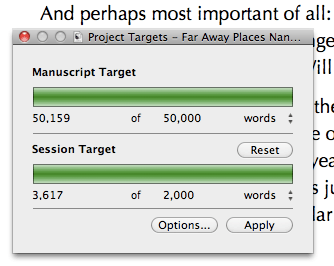 And that means the next milestone will take over as my focus: to finish the novel. I completed NaNoWriMo last year on November 25 and I ended up with 60,000 words by November 30. But I gave up after that, feeling that it was a good exercise, but what I had written wouldn’t work for a novel. This year, I’ve tried to plan things better and at the 50,000-word mark, I’m feeling very good about the story that I’m telling. My plan going forward is to maintain the same pace that I’ve been working since I started: aiming for 2,000 words each and every day until I hit 90,000 words (or finish the novel). At my current pace I should finish up the first draft around December 10. I will continue to make my daily posts of my progress so that those who are interested can continue to follow along on this process. All told, I wrote 3,617 words today, which is an extraordinary day for me. I’m planning to be back up early tomorrow to get in my 2,000 words. Very early for a Sunday since we’re hitting the road at 8am. But I’m taking the rest of the evening off. Hey Jamie, Very inspiring! Congratulations, champ! Thanks, Vern. Now I have to see if I can keep it up for another 40,000 words without the daily specter of a competition hanging over my shoulders.